Sarah Craig:: Traveller::Photographer::Blogger: Happy New Decade! As with all the blogs I read, I have also been rubbish about posting over the Christmas season. Everything always seems to ground to a halt either because of necessary family time but also this year because of a ridiculous amount of snow. 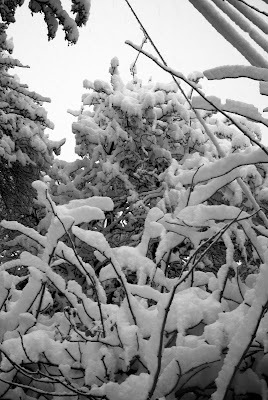 The images were taken this morning when approx 8 inches of snow has prevented me from getting to my part time job, not for the first time this season. 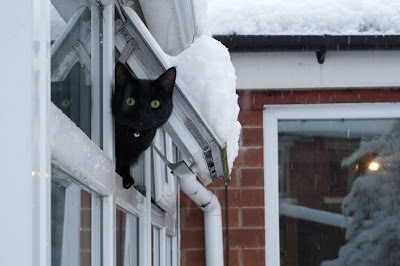 Below is Sebastian, my beautiful boy cat, looking confused by so much snow! 2010 is a big year for me. I already have more weddings booked to photograph than ever before. My masters degree will (hopefully) be finished in time for me to graduate in July. And in August I get married myself! So this year I very much hope to be brave enough to take the plunge to call myself a professional photographer, register myself as a real business, give up all other distractions and charge enough to make it worthwhile (mates rates still available i'm sure)! I hope everyone else reading this is reaching out for what they want this decade too and I wish you the best of luck.